Scouting rebels, upset with changes to the national organization, are looking to take over - SCOUT eh! Scouts Canada is facing a rebellion. A faction of Scout leaders have launched a campaign to wrest control of Scouts Canada from an administration they claim will destroy the nearly century-old organization. The struggle, which has spanned court chambers and Parliament Hill committee rooms, arrived yesterday at the doorstep of Scouts Canada headquarters on Baseline Rd. as two dozen leaders from across Ontario, Quebec and Nova Scotia gathered to discuss their next plan of action. The passion for Scouting runs high among these leaders, many who grew up in Scouts and have seen their children rise through the ranks. With membership reaching historic lows across Canada -- expected to soon dip below 100,000 -- these Scout leaders fear their beloved organization, which celebrates it's 100th anniversary next year, is about to shrivel up and die. They have become a new class of Scout, one for which no badge yet exists. "You are talking to a rebel here. A real, true blue rebel," says William Schaubs, 52, who is part of the 1st Manotick Scouting Group and who donated land to create Camp No'Chimik. "It is about the kids and they are not getting what they are deserving of getting. It is a disaster." They say a recent restructuring of the organization has created a corporate mentality and an elite, self-appointed clique that rules by edict, leaving finances in a mess and alienates the volunteers. The changes even triggered a court battle over ownership of a camp near St. Thomas. Scouts Canada says they have been forced to update the way they operate. Young people have more options, double-income families have reduced the pool of volunteers and 9/11 altered the insurance game, says spokeswoman Jennifer Austin. Insurers now demand that organizations keep better track of their assets and the activities of their members. As a result, Scouts Canada scrapped their federation-like structure for a more centralized framework. The organization is also shifting its focus to urban centres with large ethnic minority groups. Chinese Scout groups in Toronto have grown by 200% to 300% and Muslim groups are beginning to flourish, she said. The changes have helped the organization slow membership bleeding to 8% last year from a 10% decline each of the previous two years, she says. "Traditionally, we have been a white, Anglo-Saxon organization, but we actually appeal to a lot of immigrant groups because they are familiar with it from their country of origin," Austin says. There are an estimated 28 million Scouts in 216 countries. Heavily bearded Ted Claxton, 58, looks like the kind of person who could survive for weeks with a compass and a jackknife in the wilds of Northern Ontario. His hiking boots are finely oiled and his Tilley hat has a well-worn floppiness. He is the treasurer for Scout eh!, a group of about 700 renegade Scout leaders who dub themselves "the official opposition" to the Scout Canada administration. He says Scouting Canada needs to get back to its roots in order to survive. Locally driven programming and decision making is the only way to make it to the 200th year anniversary, he says. "It is not 'Scout Inc.,' it's 'Scouting,'" says Claxton, during an impassioned speech that was often drowned out by passing traffic along Baseline Rd. yesterday. "We have to put an end to Scout Inc. The corporate mentality has got to go." 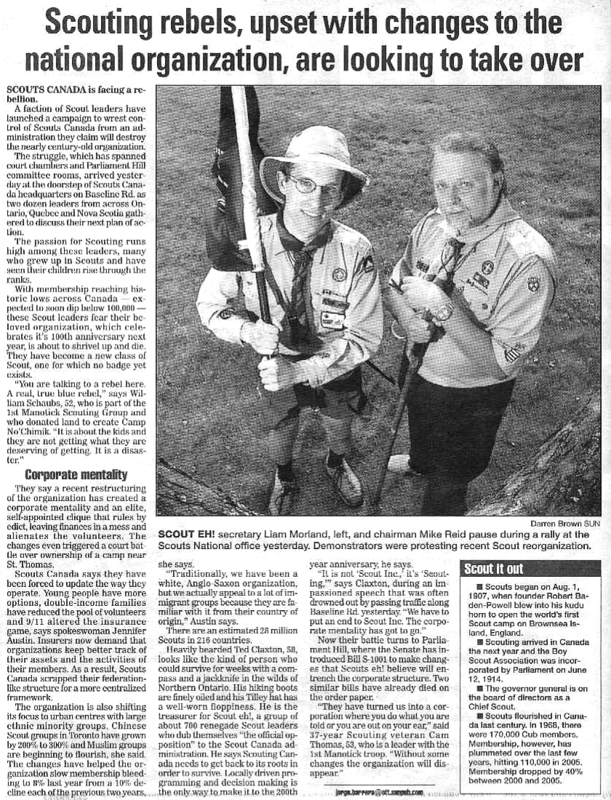 Now their battle turns to Parliament Hill, where the Senate has introduced Bill S-1001 to make changes that Scouts eh! believe will entrench the corporate structure. Two similar bills have already died on the order paper. "They have turned us into a corporation where you do what you are told or you are out on your ear," said 37-year Scouting veteran Cam Thomas, 53, who is a leader with the 1st Manotick troop. "Without some changes the organization will disappear." Scouts began on Aug. 1, 1907, when founder Robert Baden-Powell blew into his kudu horn to open the world's first Scout camp on Brownsea Island, England. Scouting arrived in Canada the next year and the Boy Scout Association was incorporated by Parliament on June 12, 1914. The governor general is on the board of directors as a Chief Scout. Scouts flourished in Canada last century. In 1968, there were 170,000 Cub members. Membership, however, has plummeted over the last few years, hitting 110,000 in 2005. Membership dropped by 40% between 2000 and 2005.